Learning your child has a health issue is scary. It can be even more disturbing if you’re not familiar with the condition. However, learning as much as possible about your baby’s health is one way to feel some sense of control in the situation. Spina Bifida (SB) is a birth defect that occurs when the spine and spinal cord do not form properly. It’s one of the most common congenital ailments in the United States. For this reason, we’ve created an overview of the condition with helpful information for parents and caregivers of children with SB. Spina Bifida is a congenital malformation of the bones in the spine. It occurs when the spine doesn’t fully develop while the baby grows in the mother’s womb. The defect occurs very early in the pregnancy, often before the woman realizes she is pregnant. It is one of several neural tube defects (defects of the brain, spine, or spinal cord), and it often results in nerve damage that could cause full or partial paralysis in the legs. Spina Bifida Occulta. This type of spina bifida is so mild, that it often goes undiagnosed. Neither the patient nor family members are ever aware of the condition. One sign though, is that sometimes it causes tufts of hair to grow on the baby’s back. Occult Spinal Dysraphism (OSD). OSD is more common in female babies. Some of the signs include red patches or tufts of hair along the baby’s spinal column. It can also become obvious by slight, abnormal changes in the shape and length of the baby’s legs or feet. It’s possible for it to go undiagnosed until the teenage years, and it may result in incontinence. Myelomeningocele. This is the most severe form of spina bifida. It consists of the spinal canal remaining open along several vertebrae. The condition is visible on the baby’s back since a sac full of nerve fluid fills up along the spinal opening. Sometimes, nerve tissue may protrude from the baby’s skin making the baby prone to life threatening infections. Meningocele. This variation of spina bifida occurs when the meninges (membranes around the spinal cord) form a sac filled with fluid making nerve damage less likely. The sac may be visible on the baby’s back, and the condition often results in mild disabilities. This is the least common type of SB. Depending on the severity of the illness, a baby may grow up to walk unassisted, while others may need the help of crutches or braces. In the most severe cases, the child may need a wheelchair. 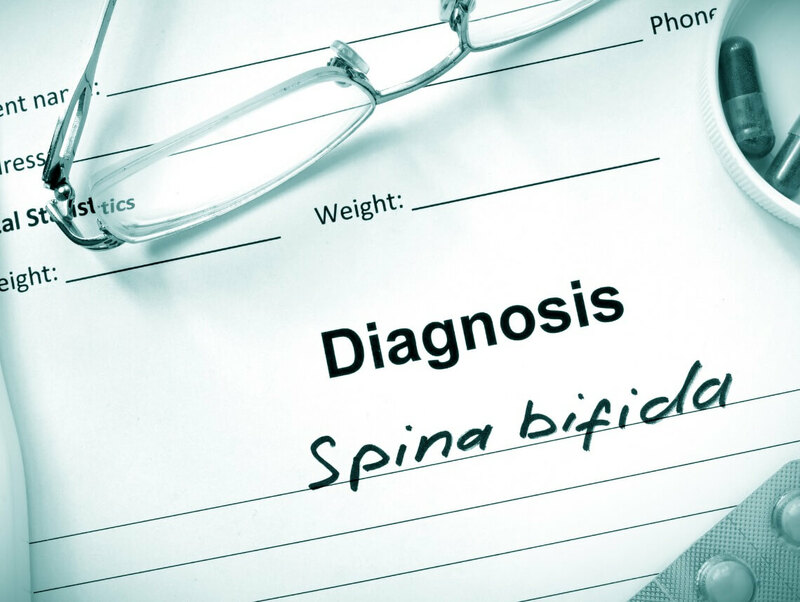 Signs and symptoms of Spina Bifida vary by type and severity and can differ for each person. The condition is discovered by noticing abnormalities on the skin along the child’s spine. In the more severe cases, Spina Bifida can be diagnosed before the baby’s birth. If the mother has a family history of Spina Bifida, her doctor can do blood tests or an ultrasound to help determine whether the baby will be born with the condition. What Causes Spina Bifida in Babies? The cause of Spina Bifida is unknown. However, genetics and the environment may be influential factors. Treatment for SB requires spinal surgery within days of the baby’s birth. The good news is that many babies born with spina bifida grow up without experiencing any kind of paralysis. Some hospitals will even conduct the surgery while the baby is still in utero. This is done to minimize damage to the spinal cord while the baby is still in the womb. Treatment after birth may include medications, physical and behavioral therapy, and muscle-strengthening exercises. Babies with Spina Bifida are also prone to developing sores and blisters. Therefore, it’s important for parents and caregivers to regularly monitor the baby’s skin; especially along the baby’s back, buttocks, and legs. We also recommend ensuring that the baby’s bathwater is not too warm. One of the best ways to reduce the chance of having a child with Spina Bifida is to take folic acid regularly. Doing so will decrease the likelihood of a baby developing a neural tube defect by about 70%. Experts recommend that all women of childbearing age take a daily supplement of 400 mcg of folic acid. Since the condition happens during the early stages of pregnancy and so many pregnancies are unplanned, we recommend taking it daily, regardless of whether or not you’re currently trying to conceive. There are several ways of consuming folic acid. In addition to buying supplements, it can be found naturally (as folate) in leafy greens, such as broccoli or spinach, beans, citrus fruits, beets, Brussel sprouts, egg yolks, nuts, bananas, avocados, and some fortified grains used in breads and pastas. If you’re acting as a caregiver for a child with Spina Bifida, let us help you. At Sonas Home Health Care, we have an entire team of experienced caregivers to ensure the wellbeing of your baby.